www.EnfoStuff.com :: View topic - Zodiac Starter Relay to Blame? Zodiac Starter Relay to Blame? Posted: Mon Nov 12, 2012 3:15 am Post subject: Zodiac Starter Relay to Blame? Yesterday I went to start the faithful Zodiac. It turned over once but didn't catch (which is normal when the car hasn't been started in six weeks). I tried again and this time all I got was a "click" from the starter relay. Do people think that the problem is likely to be the relay? ...or a flat battery, or a dirty connection, or a faulty starter, or the pinion jambed with the flywheel ring. 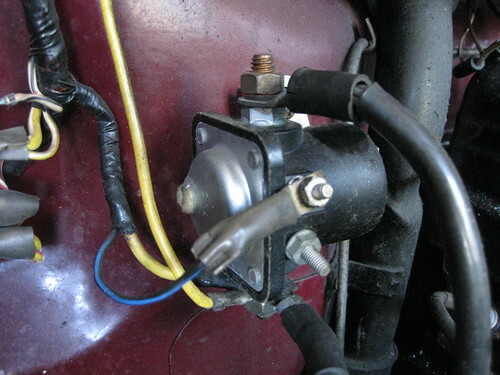 Try again with headlamps on; if they go dim when the key is turned, the solenoid is alright. Thanks Jan. I know the battery and terminals are good. I'll try that with the headlights. I hope it is the solenoid as it would be easy to replace. You coud also take a jump lead from the starter teminal to the battery live terminal. If all else is working, you'll get a big spark and then the engine should begin to turn over. A bit naughty, but it works! Well, I got as far as checking the lights and they are strong. I could try the trick you mentioned. Someone else has also suggested checking the connection where the battery ground cable is attached to the car. I'll try that first. You may also want to check the ground strap from the body to the engine. Make sure the connection is clean and tight. This strap is usually located near the slave cylinder it maybe in the same location for an automatic. Update: So the "do nothing" theory worked in this case. After letting it sit for a month, I tried again and it started right up (and restarted).